Alhamdulillah, Ramadan is almost one month away. May Allah allow us to reach Ramadan and may Allah accept it from us, ameen. 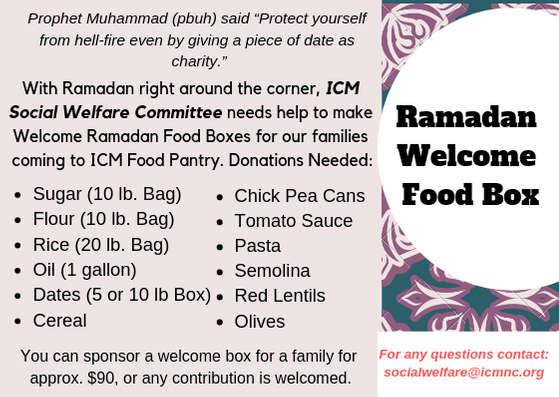 This Ramadan the ICM Social and Welfare Committee has something special planned for the families who visit the Food Pantry. We are launching a campaign to collect basic food items for Ramadan to distribute to the families who come to the Food Pantry in our “Welcome Ramadan Food Box”. Collection boxes for food items will be at ICM and any monetary donations for this campaign can be given to the Imam or dropped in the masjid donation box. The cost to sponsor one complete box is $90, but any amount is welcome. Please mention ‘RAMADAN WELCOME BOX’ on the envelope. See the poster below for items to be included in the box. We will be packaging the boxes on April 27. 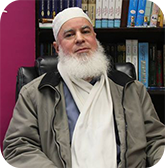 As in past years, during Ramadan the ICM Food Pantry will be open every Saturday to serve families in need, in sha’Allah. Your continued support is greatly appreciated.